The goal of this project was to implement behaviour of animals like fishes, birds who move in groups (flocks, schools, herds etc.) 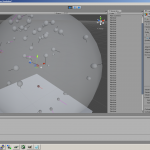 in Unity 3D. We decided to implement concepts described by Craig Reynolds in his “Boids” project (http://www.red3d.co/cwr/boids/). Predators and victims in a 3D environment. 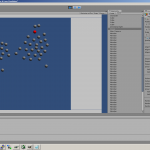 A flock using Unity3D rigid bodies. Flock members (represented by the FlockMember component) are grouped into groups (represented by the FlockGroup component). FlockGroup is a component that should be attached to a dummy game object. Each FlockMember holds a reference to its current FlockGroup. Tweaking FlockGroup properties can change behaviour of its members entirely. It is recommended to choose the parameters experimentally. The FlockGroup fills its FlockMembers’ public flockOutput fields that represent where each flock member would like to go according to its herd instinct. Please note that FlockSimulator components don’t actually move any objects, just express the desire of every flock member to go in a given direction. It’s up to the programmer to use flockOutput to obtain the result that is expected. Wedecided to make it that way to ensure flexibility.